Delegates of the UK Labor Party voted Tuesday to ban arms sales to the “Israeli” entity over its abuses against the Palestinians. This party policy that could be translated into official government policy if and when the party is elected to lead the United Kingdom. The motion was passed at the party’s annual conference in Liverpool. It called for an “independent international investigation into ‘Israel’s’ use of force against Palestinian demonstrators,” an “immediate and unconditional end to the illegal blockade and closure of Gaza,” and “a freeze of UK Government arms sales to ‘Israel’”. The motion noted that amongst those martyred during the Palestinian protests of recent months are paramedics, journalists, women, and children, while than half of the injured were hit with live fire by snipers as they approached the border with the “Israeli” entity. Palestine Solidarity Campaign (PSC) Chair Hugh Lanning said: “We have witnessed extraordinary scenes of solidarity today and the Labor Party has done the right thing by recognizing the longstanding injustice of the entity’s violation of Palestinian rights. 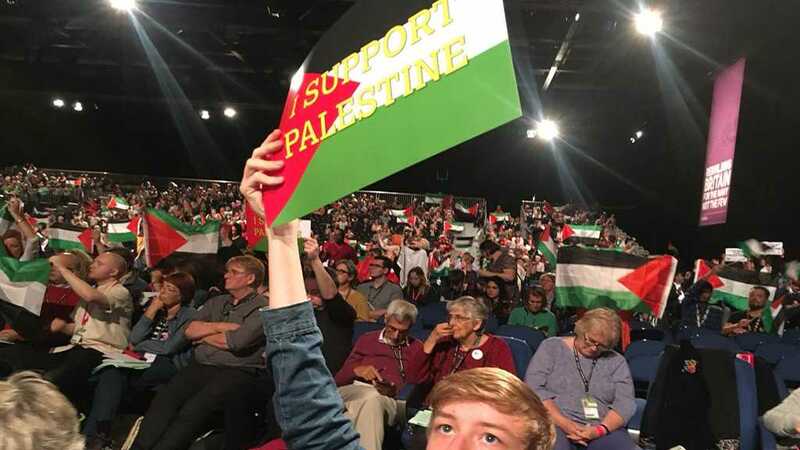 During the debate on Palestine, the party deliberated on UK arms sales to the “Israeli” entity, voting to end them until an independent investigation into the murder of more than 180 protesters in Gaza since March 30 can be carried out. The anti-Semitism charges against Corbyn were rejected by him, his supporters, and Palestinians citing the entity’s attempt to shut down any criticism of its policies and abuse against Palestinians and its occupation of their land. But not all Palestinians are overjoyed with the new policies. Some are critical of the UK’s stand on the Oslo agreement which supports the creation of two states. For UK-based Palestinian author and academic, Ghada Karmi said during a Palestine Solidarity meeting that Labor cannot go on supporting a “defunct idea”. She also asked the party to stop being apologetic about the “Israeli” entity’s atrocities and to confront the entity and call out its actions against Palestinians. According to Hazem Jamjoum, a Palestinian-American academic, the British empire helped create the so-called “state of ‘Israel’”; hence, it has a greater responsibility to support Palestine. He also warned that the entity’s impunity regarding apartheid, racist laws and ethnonationalism is creating precedents all over the globe, which is witnessing an increasing identity-based nationalism in many countries.